Published by Enitharmon Press, 2004. For more information click here. Impelled by a sense that our personal, social and corporate behaviours grow ever more infantile, these are poems that scrutinise the child, the child-like and the childish. Writing with humour, candour and precision, Crucefix’s fourth collection reflects the innocence and distress of modern childhood, its often bewildering transitions into the adult world where egotism, anger and acquisitiveness wait. 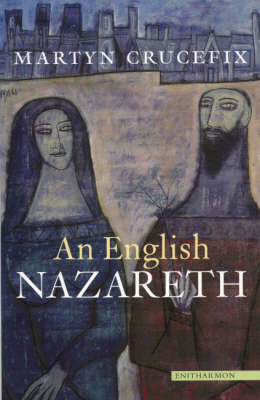 An English Nazareth calls up an extraordinary cast of real and fictional characters – Alexander von Humboldt, Mr Marvel, Lady Richeldis of Walsingham, Wimbledon referee Alan Mills, Radovan Karadzic, the Cleverly boy – and in doing so these poems further extend the formal and tonal range of a writer whose work confronts us with the fact “of innocence already dead, / the book’s sole intent to show it had to happen”. To keep it steady, I stand on the bottom rung. creaks and squeals under your stepping weight. It sounds like coins being scraped together. in charge of your tall, Edwardian house. now you find a way through your own walls. that sees no need of a constitution. Now that looks as much risk as opportunity. the strangeness of our futures a thing yet to learn. palm flat to one end. of heat, yeast, risen air. bring back to the house. where she embroiders her mornings. on the clay floor, the cramp, the cool. because of this her dream has weight. still warm in the red-grained wood. as she passes a door out of Palestine. richly through Christ’s small house. English wood upon English earth. long in grace, in that other real place. give praise to God for the gift of work.